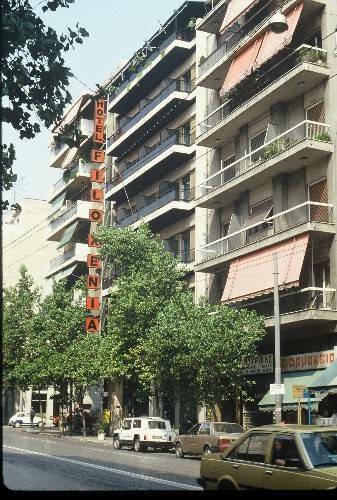 Hotel Filoxenia in Athens with 51 rooms, is situated near the National Museum and Victoria Square metro station and 500m from Larissa (international train station). Spacious rooms offered with telephone, T. V, WC, air condition and private bath. Guests can take in the beauty of Athens from the roof garden, taste the delicious food in the hotel restaurant, or sip a relaxing drink in the hotel bar. Buffet breakfast is served in the rooftop restaurant daily. One twin bed. Neutral décor with dark wood furnishings and dark fabrics. Central heating, air conditioning, telephone, television. Cancellations : 48 hours before arrival - no fee. After that 1 night's charge. Metro ( Proastiakos ) to Larissa station then up Ipirou street the corner with Aharnon street at your left. Metro to Victoria sq. then down Ipirou street in the corner with Aharnon street at your right. Up to Larissa station and to Ipirou street in the corner with Aharnon str. on your right. From the airport, guests should exit at the south gate and take Attiki Odos, then turn left onto Marathonos Avenue and continue to Messogeion Avenue, then Vassilisis Sofias Avenue, and onto Syntagma Square. Here, turn right on Panepistimiou Street and drive straight ahead to Omonia Square. Turn right on 3rd Septembriou Street, then turn left on any side street onto Acharnon Street.